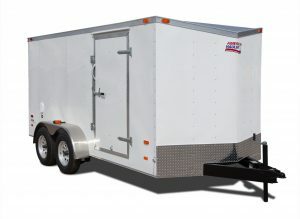 The Arrow trailers are designed as our light weight steel models and is our “ECO” version of the Night Hawk Trailer. The V-nose and tapered roof, coupled with a variety of sizes and options make it the perfect trailer for the following applications: hauling motorcycles/ motor sports, household items, moving kids to college, furniture moving/ storage, scout troops, and weekend enthusiasts. Call us with your specific needs and we will give you a quote.